Why do macular holes occur? Macular holes can occur for several reasons including trauma, myopia (near sightedness) or vitreomacular traction. Vitreomacular traction is the most common reason for why macular holes occur. The vitreous gel occupies the middle of the eye. As part of the normal aging process, the vitreous gel liquefies and pulls away from the retina. Sometimes, the vitreous is more firmly attached to the macula than it should be. As a result, when it tries to pull away, it exerts traction on the macula and can lead to a full thickness hole. What are the symptoms from a macular hole? The visual symptoms from a macular hole depends on the stage of the hole. In the early stages, the only symptoms might be slight distortion or blurring of the vision. If the macular hole is full thickness, it can be associated with decreased vision and impair your ability to perform fine detail tasks. Your ophthalmologist can diagnose a macular hole through a dilated eye exam. Special tests such as Optical Coherence Tomography (OCT) or fluorescein angiograms may also be ordered. 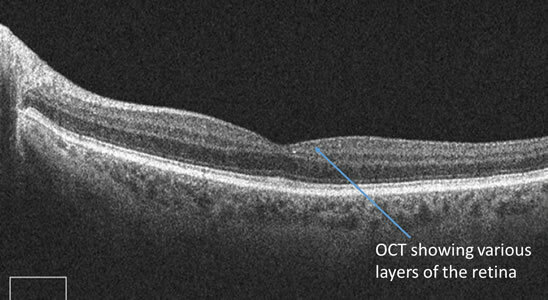 An OCT allows your ophthalmologist to obtain a 3-D cross section of the macula and study the macula in great detail and see if a macular hole is present. A fluorescein angiogram is a dye test that allows your ophthalmologist to evaluate the blood vessels in the retina and check for leaking or new blood vessel formation. What are the treatment options for a macular hole? If the macular hole is in the very early stages, your ophthalmologist may watch it very closely. 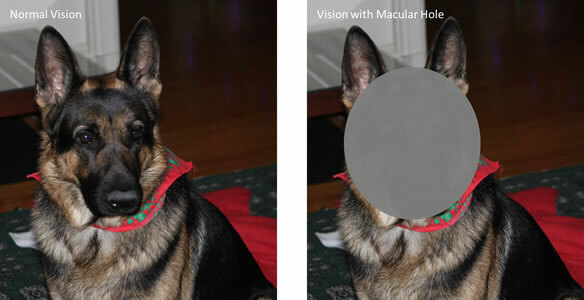 If the macular hole is more advanced and is full thickness, it will have to be surgically repaired. The vitrectomy surgery is an outpatient operation. The vitreous gel as well as all membranes exerting traction on the macula are removed. Gas or silicone oil are used to push the hole closed. If gas is used, you will be asked to wear a green band on your wrist until the gas goes away and refrain from flying. You will also be asked to keep your head down for several days. If oil is used, a second surgery may be needed. Your ophthalmologist will review all the risks and benefits of surgery with you. What are the chances that my other eye will develop a macular hole? 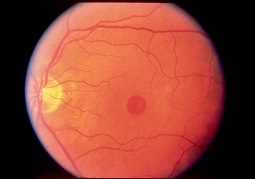 If a macular hole occurs in one eye, there is a 10-15% chance of it occurring in your other eye. Your ophthalmologist will review these risks with you and keep a close watch on your unaffected eye. What is the visual prognosis after macular hole surgery? The success of a macular hole surgery depends on the size of the macular hole and how long it has been there. Your ophthalmologist will review the details of your particular case with you.